Chuletas Guisadas aka Stew Pork Chops are an undisputed favorite in my house! To start, anything guisado is bound to be delicious because the flavors have had a chance to soak and develop. Not to mention, the sauce from anything guiso makes eating rice and beans all the more delicious! Chuletas Guisadas are no different. In fact, they’re in a league of their own because who doesn’t love Pork Chops! Pollo Guisado reminds me of home and Carne Guisada is my childhood on a dish. Chuletas Guisadas reminds me of special days when grandmother would switch it up. She never made this dish weekly like she did the other two, but she made it frequently enough to always have the family stop by for seconds and thirds. 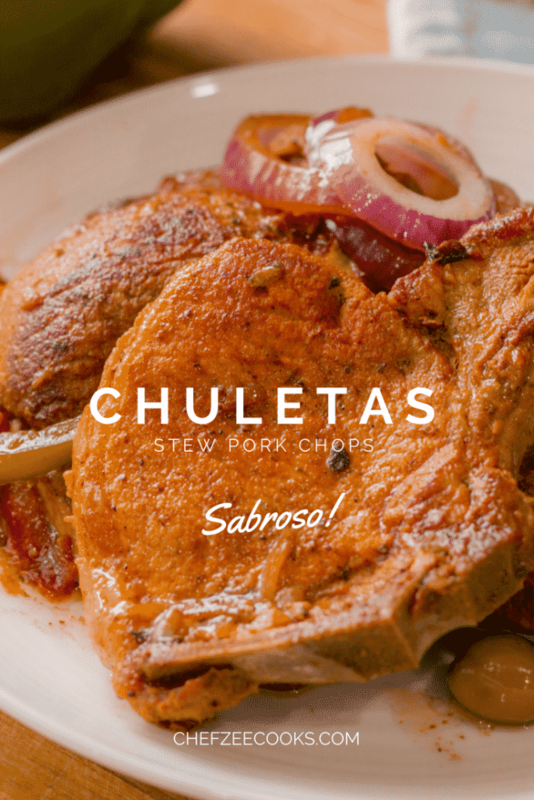 Funny enough, Chuletas Guisadas is also one of the most affordable dishes you can make for you and your family! I find myself always making this dish whenever the family pack of Pork Chops are on sale! 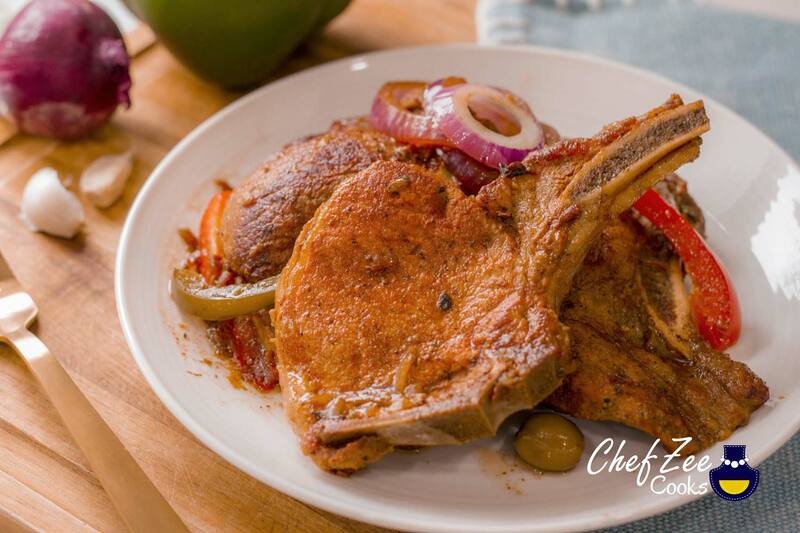 Now the beauty of this dish is that you can make it with whatever cut of Pork Chops you like whether it be Bone-In, Center Cut, Boneless or more. The trick (as it always it with all of my recipes) is to use fresh ingredients which means dicing up onions and peppers and squeezing fresh limes! Believe me when I say that it makes all of the different! Granted cooking with fresh ingredients can sometimes get expensive but your tastebuds will forever thank you. Don’t be shy to buy your onions, peppers, and garlic at wholesale big box stores like BJ’s and Costco. Feel free to frequent the farmers market during the Spring, Summer, and Fall for even better deals! Hispanic Cooking is all about the integrity of the ingredients that you use, which is why I always encourage you to use the best possible ingredients that you can. Keep in mind, that making your own sofrito and freezing it prolongs the life of your fresh ingredients. It also ensures that your food always comes A1! #4: Onions & Peppers: No Guiso is complete without onions and peppers. It’s what rounds out the dish and gives it its charateric color and flavor. I like my onions and peppers on the crunchy side, so I add them at the end and let the steam do the work. If you like them softer, feel free to cook them a little longer. I also like to add a touch of red or white vinegar at the end. It pickles the onions ever so slightly and gives it that undeniable Dominican touch. Imagine the onions from a Mangu but toned down to about 10%. If you’d like to see me whip up this classic Hispanic Caribbean Dish be sure to visit my YouTube Channel: Chef Zee Cooks! Finely slice red onions and red and green peppers. Set aside. *Note: This set of onions and peppers will be used at the end.